Dr. Therese O’Sullivan is a dietitian, lecturer and mother to two young boys. She also happens to one of my closest friends, having spent many mornings and afternoons sharing a commute with her to and from school each day on the train, playing in sporting teams together, sitting through classes together and hanging out every lunch break. Over the years, life circumstances and distance meant our relationship grew apart somewhat until the powerful bond of motherhood drew us back together. I was so grateful and honoured, therefore, when Therese agreed to write the very first guest post for PPCK on a topic that I am sure we have all struggled with at some point – nappy changes and tooth brushing. Upon hearing about RIE (Resources for Infant Educarers) from Kate when my first-born was little, many of the principles made sense. However, it wasn’t until my cheeky monkey started pushing boundaries that I really saw RIE work its magic. Two experiences have stood out – nappy changing and tooth brushing. Mr 1 year old was refusing to lie calmly for his nappy change on the change table mat, preferring to run around the house like a manic. He was like Hansel and Gretel leaving a trail of breadcrumbs around the place. Except he wasn’t using breadcrumbs! Kate suggested offering a him a choice by asking Mr 1 where he would like his nappy changed. She explained that toddlers have a strong desire for autonomy and respond well to feeling a degree of control over matters involving their care. Within a couple of minutes, he had chosen his place and proceeded to lift his legs in the air, ready for changing. Nappy changes have been relatively a breeze since. On one occasion, I asked him to choose his nappy change place but then became side tracked with something else. About 5 minutes later, I caught a glimpse of him as I walked past a room – he was still lying there patiently, waiting for his nappy change with his legs up in the air! This success inspired me to apply RIE to other situations. Unfortunately, not all situations are as easily addressed as the nappy change issue. Having turned 2, my little man was now objecting to having his teeth brushed. In the midst of my husband hanging him upside down and tickling him so I could stick the brush in his mouth, it occurred to me that this was not respectful parenting. There was no partnership where we valued his input in these situations. We were doing things ‘to’ Mr 2 rather than ‘with’ him. I started to brainstorm some alternatives. Mr 2 liked songs, so I decided to incorporate that into our routine. At teeth brushing time, we went to the bathroom, allowing extra time for us to slow the process right down. I closed the doors. I explained to him that brushing keeps his teeth healthy and that I wouldn’t let him leave until we’d done his teeth. However, it was up to him when he wanted to do it. To help entice him, I also mentioned that there was a special teeth brush song I’d sing while brushing his teeth. I sat in the corner and prepared myself for the long haul. Of course, having been given the choice, he was not interested in teeth brushing. He was much more interested in emptying the rubbish bin, redistributing the contents of the bathroom cabinet draws and hiding behind towels. I stayed calm and didn’t rush him… I likened it to conducting an experiment. Mr 2 would come over and want to hear the song, but not stand close enough for teeth brushing. I stayed where I was – I explained that the song was a special song just for teeth brushing. Each time he came over he’d stay longer. About 45 minutes later, he came up, opened his mouth and we had a proper teeth brush while I sang the toothbrush song. ‘Top teeth, bottom teeth, brushing teeth is fun. The last bit was to add a bit of silliness and he enjoyed sticking out his tongue. Once I’d gone through the song twice, it was then his turn to brush his own teeth, which he quite liked. Over the course of one and a half weeks, the time Mr 2 would take to come over for his teeth brush gradually improved, until eventually he came straight over. Brushing teeth was now an enjoyable part of the bedtime routine for everyone. Down the track, he was even allowed to squeeze the toothpaste onto the brush. This second example of using RIE took longer, but our patience paid off. I used to get stressed out and upset when my toddler threw different ‘challenges’ at me. Now, I see opportunities to exercise the old grey matter by using RIE as a basis for problem solving (hmmm… how are we going to deal with this one??). As a result, it is easier to stay calm and come up with a win-win situation. Some solutions take longer to work than others, and sometimes the first idea won’t work. But remaining respectful and working with our child has been completely worth it in the end. This entry was posted in Parenting Peacefully, Peaceful Discipline and tagged brushing toddlers teeth, Respectful Parenting, RIE, Slowing Down Care Giving Moments, toddler nappy changes, Toddler tooth brushing on January 23, 2015 by peacefulparentsconfidentkids. i have a 3 1/2 yr old daughter and a 6 month old son. I don’t have 45 minutes to sit around and wait for things to happen. How would you handle the situation with your toddler knowing you’re having to take care of your infant too? Thanks. Then you can try giving the option for which teeth (top or bottom) they would like brushing first. Ask them to have a turn and then you have a turn. You can try making it a game like “I can see some carrot on your teeth. That carrot wants to sleep in your mouth. We can’t let carrot sleep in your mouth. lets get that carrot out of there.” And so on naming some of the food they have had recently and telling her we cant let them sleep in her mouth. 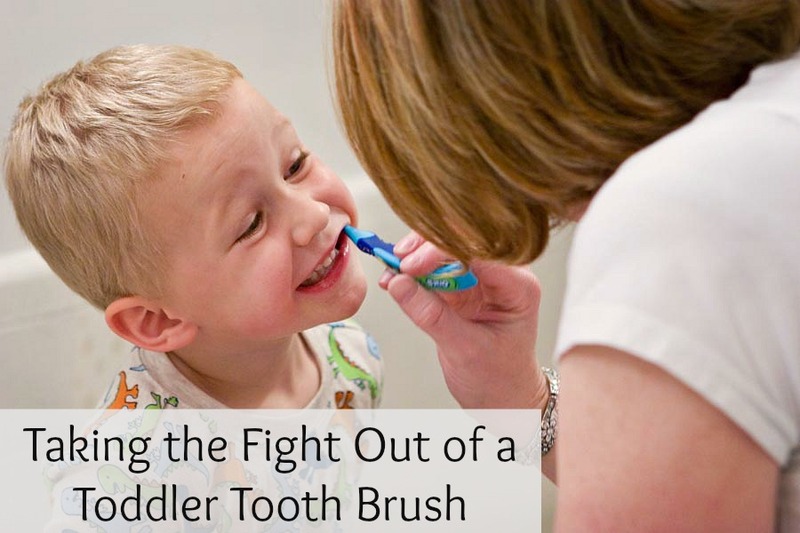 Ultimately if none of those things entice your child and your child is really putting up a fight, you can either set it as a firm limit and use more forceful means to have her open her mouth whilst acknowledging her feelings or you can let her take some ownership and ask her to let you know when she is ready to have her teeth brushed. If you are brushing your teeth twice a day and letting her see you and offering for her to join in with you when she is ready. She will eventually do it. Good luck, I know how hard this can be. Stay calm and ride the wave. Have you tried Babywearing? I put my infant in a MaiTai on my back after she is changed and fed. She will usually go to sleep, and that gives me a good amount of time to deal with something time consuming with my older two. My son is the and a half and just recently we find a way that makes teeth brushing enjoyable. He just wanted to stick his tongue out and brush his tongue, so now I say “ok, I’m going to do your tongue for one brush, then your teeth for one brush.” And we alternate tongue and teeth until all the teeth are properly clean. I love it, Anna! Thanks for sharing! One thing that worked miracles for teeth brushing for my toddler is to let her brush my teeth while I brush hers. She looks forward to it now. Perfect, Amy! Thanks for sharing! My son is 17 months old and brushing his teeth is awful, he hates it. I’m so grateful I stumbled across this article. I’m going to try and give him more choices in the process and pray over time it will work. Thank you! Good luck, Joanna. Let us know how it goes. I’m lucky to have never encountered teeth brushing difficulties yet but I hear it’s really common. Some great advice! Wow!! All way over thought! Too many options!! The babies *2 of them* get changed on the table, no options. And their teeth brushed there too. I brush them to clean, then let them brush their own teeth to teach. I’m so pleased this method works for you, Michelle! I love giving choices to my own kids and my students. I think it shows them I respect them and care about their feelings and desires. Our older son can be quite stubborn (like his mama)! I don’t remember where I read this suggestion, but it has been magic for us… We offer him two times for when he would like to do something and base those times on how much time we really have for the task. So, we might say, “Would you like to brush your teeth now or in two minutes? Would you like to play for five or ten more minutes?” Two minutes certainly isn’t a great amount of time, but we have given him something more important than time. We have given him a choice and shown him that we value his wants while respecting the need to brush his teeth or leave the park. One other thing that has helped is to make things a race. He likes to beat us upstairs or to the bathroom. Sometimes, life just gets too serious and we all need more FUN! I often wish I had someone offer me these same courtesies as a professional! Thanks for your article! It is always important for me to be reminded that little people are people and I need to treat them with the respect I would like. I love those ideas, Ami. You clearly have a lot of respect for not only your own children but those you teach as well!! Thank you for sharing! We’re lucky that we’ve never had too many issues. But one time when the kids were starting to show reluctance, I found some really awesome toothbrushes (I can’t remember where) that came with waterproof mini stickers so the kids could personalise their own toothbrush. I let them stick a few new ones on each night, and it really turned our toothbrushing experience around before they really had a chance to dig their heels in. I have had these struggles all too often as a mom of 3, ages 5 and under. My middle son is especially strong-willed and will refuse to do just about anything I suggest. For things that are a “must-do” like teeth brushing, I will tell him to let me know when he’s ready while I go about other household duties or tend to other kids. Eventually he comes around and says he’s ready. If he asks me to do or get him something before he lets me brush his teeth then I just remind him that after he brushes his teeth he can do whatever it is he asked for. With the nappy changing the strategy of letting her choose the time and spot works quite good. It’s just not always possible to let her choose. In a Mall etc.